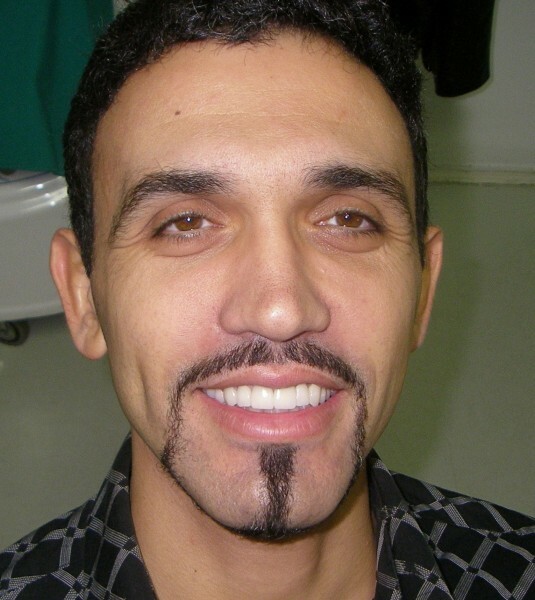 Patient who had a removable denture in lower jaw. 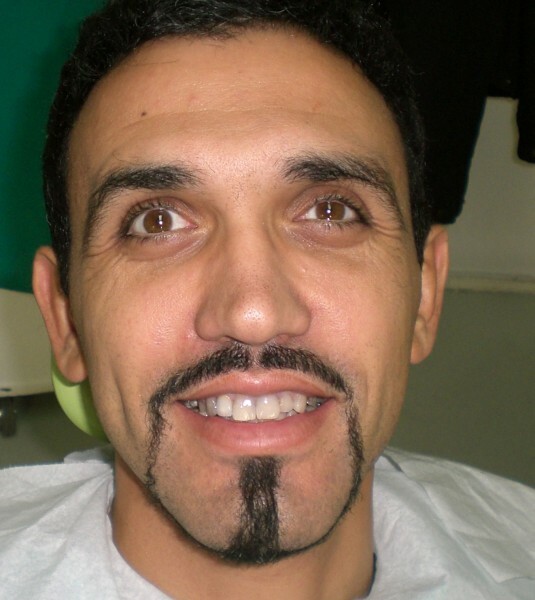 He was interested if it is possible to make fixed full arch prosthesis. After examination and 3d x-Ray analysis the decision has been made to extract all the remaining lower teeth, and to proceed with All-on-4 concept. Four implants were placed, and patient got temporary fixed solution next day. 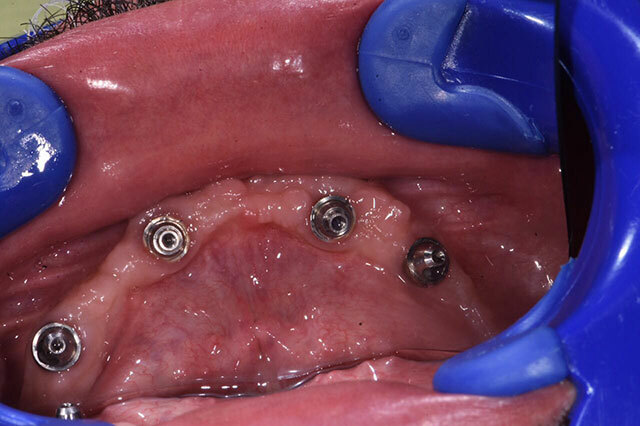 After healing period we made definitive fixed screw retained prosthesis. 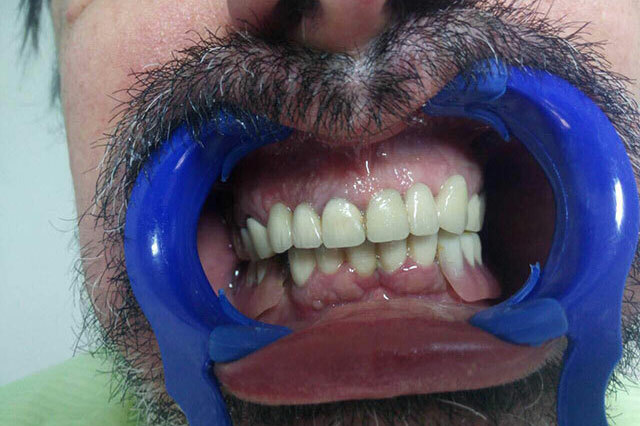 A 20-year-old patient, unsatisfied with the position of his teeth, did not want orthodontic therapy so we applied a prosthetic one. 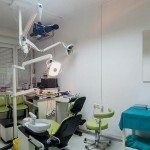 A cast build-up and two metal-ceramic crowns were made. 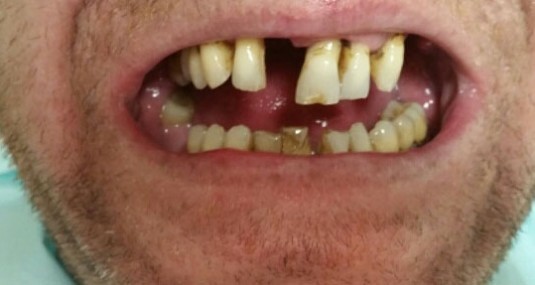 A 25-year-old patient was unsatisfied with the appearance of her teeth. 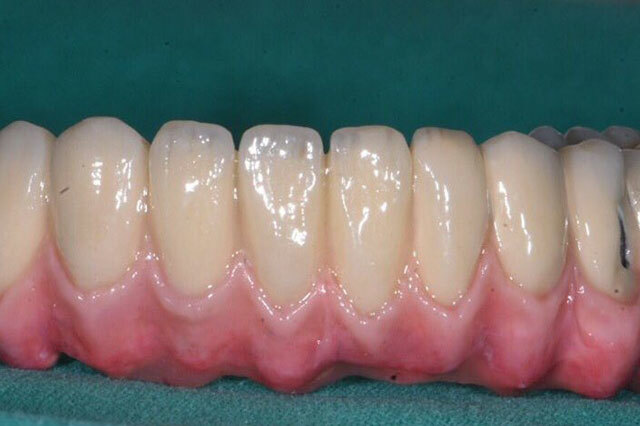 We removed the old bridge.Based on our dental technician’s wax-up model of her future teeth, we made a surgical guide with the help of which we surgically leveled the gumline of the front upper teeth (gingivoplastic was performed). 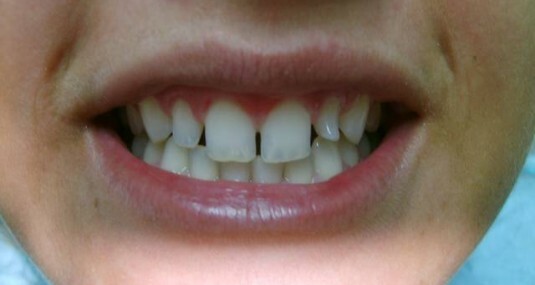 In other words, we extended the clinical crowns of her right central and lateral incisor teeth. Along with that procedure a frenulectomy was also performed. Erbium-Yag laser was used in this surgical part of the therapy. 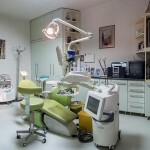 On the same day, temporary crowns were fitted which were identical in shape, size and position to the permanent ones. 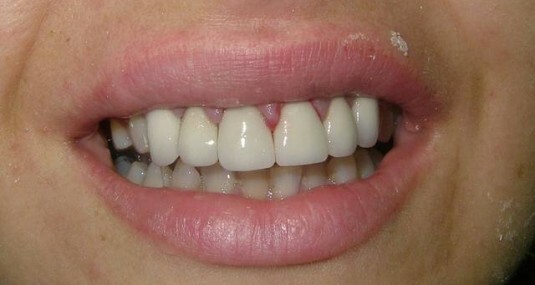 After a period of healing which in this case took one month, permanent porcelain-fused-to-metal crowns were fitted. 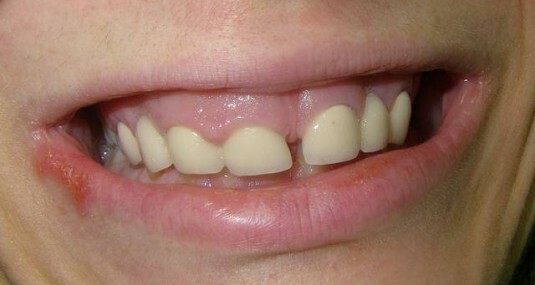 A 30-year-old patient, unsatisfied with the shape and the position of her teeth. Based on our dental technician’s wax-up model of her future teeth we made a surgical guide with the help of which we surgically leveled the gumline of her front upper teeth (gingivoplastc was performed). Erbium-Yag laser was used for this surgical intervention. 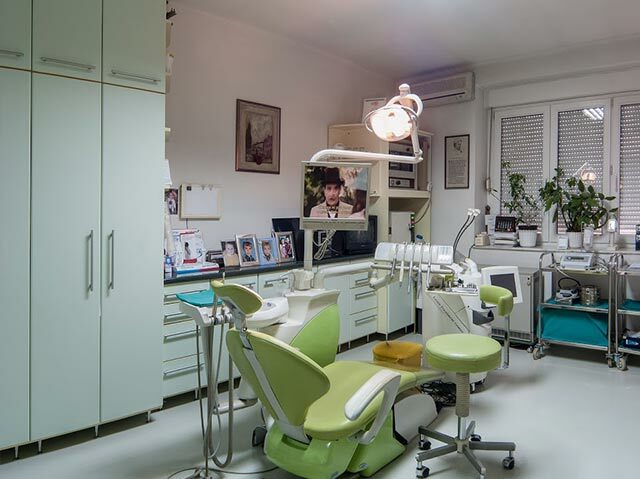 In this case, we waited for two weeks after which we abraded six front upper teeth and fitted six solo porcelain-fused-to-metal crowns. 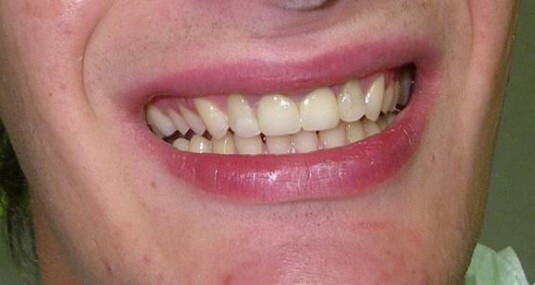 The photograph that shows the final result was taken immediately after the cementing of the prosthetics which is the reason why the gums around the teeth are under a small inflammation which wears off in several days. A 20-year-old patient. 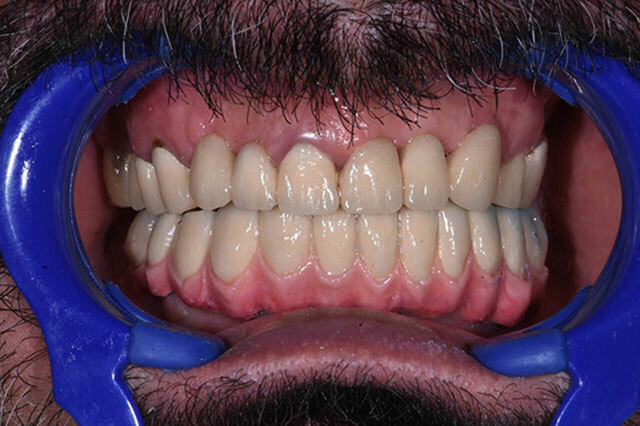 After devitalization performed on central incisor teeth some years before, the colour on teeth 11 and 21 changed. 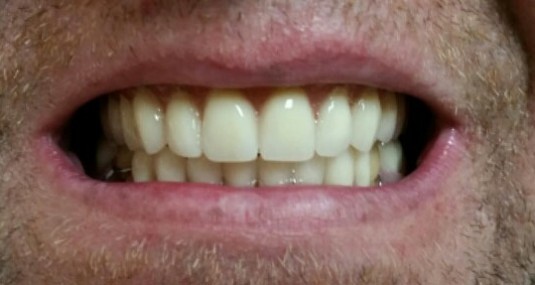 Whitening of those teeth was not possible since great part of tooth substance was compensated with fillings.Our patient agreed with our decision to fit two all-ceramic crowns. The patient in the photograph turned to us wanting to improve aesthetic of her smile since she disliked the shape of her upper incisor teeth and the presence of diastema. We decided to leave the central diastema as ’’a part of her personality’’ and change the shape of her central incisor teeth using composite, while in the case of her lateral incisor teeth a more radical approach was chosen using all-porcelain crowns. 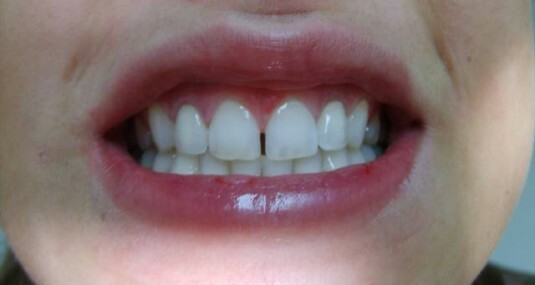 After changing the shape of her central incisor teeth, an improvement could already be noticed. 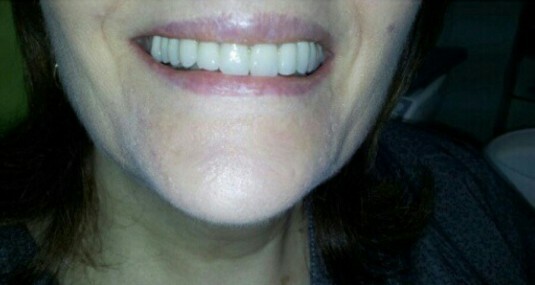 After this, fitting veneers changed the shape of her lateral incisor teeth as well and the aesthetic of the smile was evidently improved. 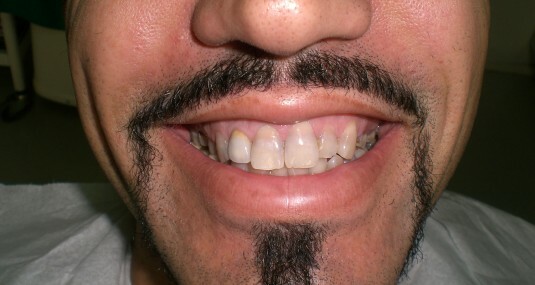 A 37-year-old patient, unsatisfied with the colour and the position of his teeth. 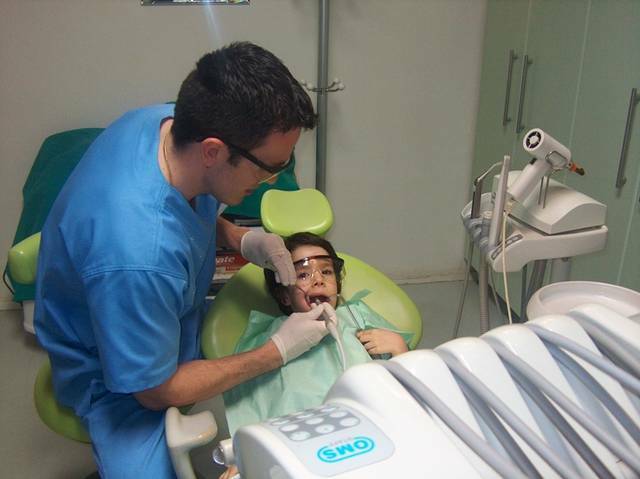 During the first dental treatment tooth 17 was extracted and bonding procedure with fiberglass (non-metal) posts was performed on all posterior teeth. 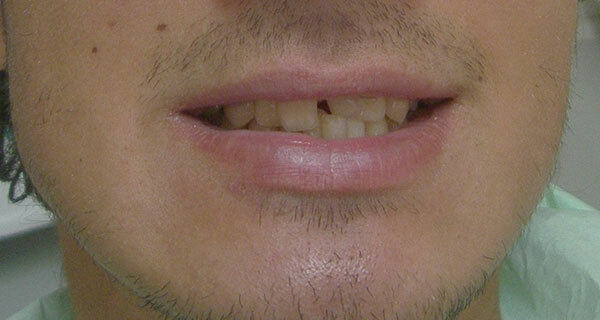 Tooth 12 had a metal bonding which we replaced with a all ceramic one, since it was planned to fit all ceramic crowns. 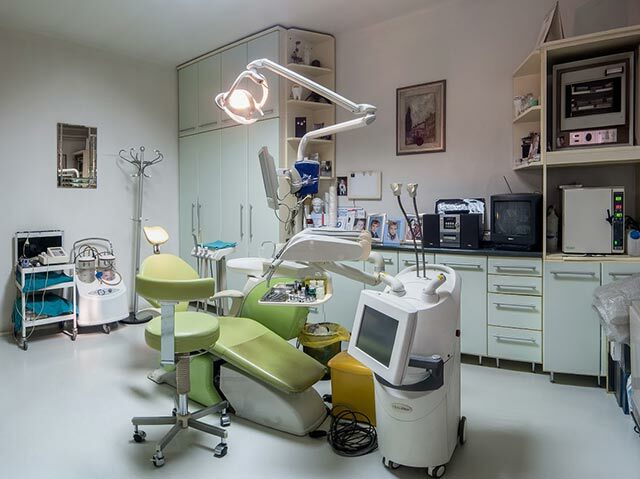 Also, using Erbium-yag laser, gingivoplastic surgery was performed in the region of tooth 11 in order to lengthen the clinical crown of the tooth. We also performed frenulectomy using CO2 laser. 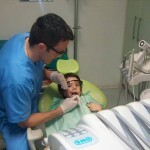 After we had waited for 3 weeks, we abraded the anterior teeth and we finished the preparations on the posterior teeth. 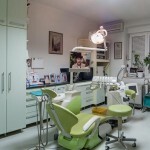 The final result can be seen on the photographs. 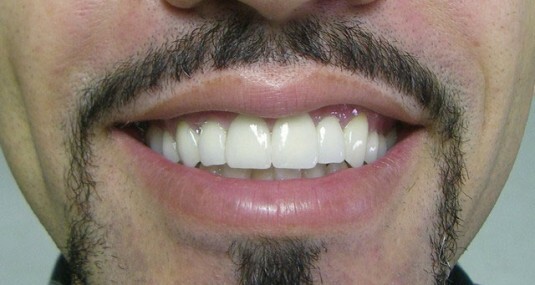 Solo crowns were fitted, with the exception of region 18-16 where tooth 17 was missing. An all-ceramic bridge was placed in that region. Patient aged 41. 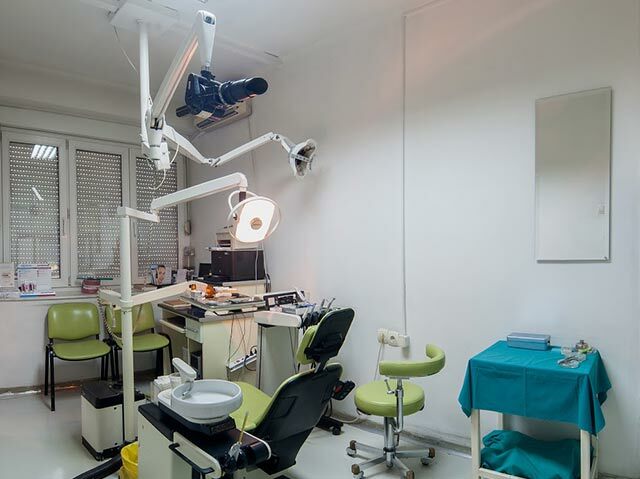 The patient had 15 teeth extracted from the upper and the lower jaws. 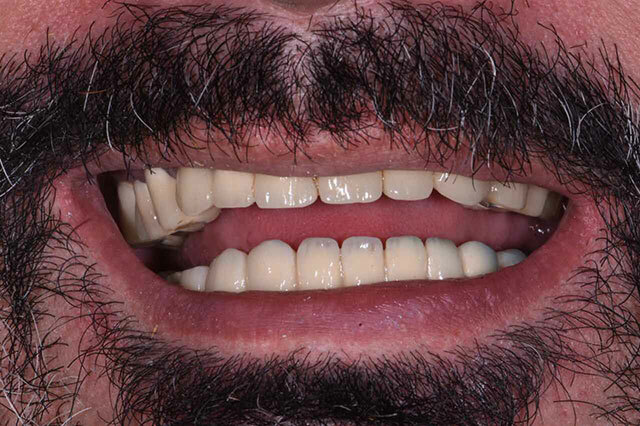 A complete upper denture and a partial lower denture were made. 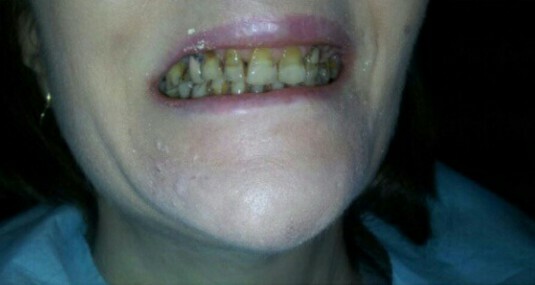 The patient came to us dissatisfied with the appearance and health of her teeth. 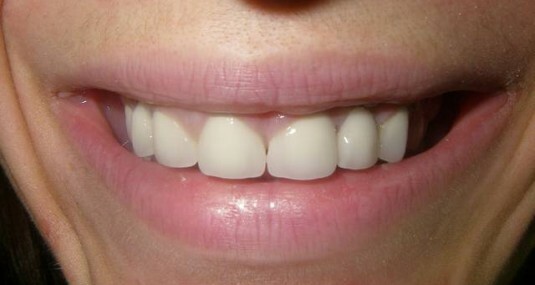 A reconstruction with non-metal crowns was done.